“Start every day off with a smile and get it over with” ~ W. C. Fields. 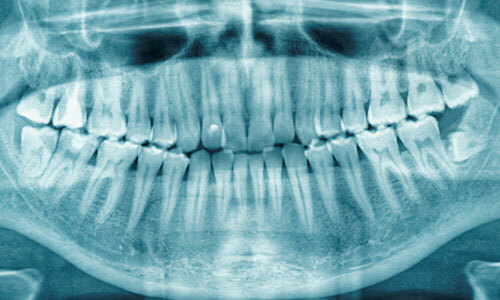 An important part of your oral health care X-Rays or Dental Radiographs Are dental x-rays safe? An important part of your oral health care is to have regular dental check-ups. It is during these exams that we determine your overall oral health, the condition of specific areas such as the health of your gums or the presence of cavities, and we look for other problems like oral cancer or the need for braces. During these check-ups you will receive one of several types of dental exams. Comprehensive Exam – Also called the Comprehensive Oral Evaluation, this exam is typically done for patients who are new to the practice. As the name implies, it is a comprehensive or complete look at the overall dental health of the patient. Comprehensive exams are also done on patients if it has been a while since they have been to see the dentist. During a comprehensive exam we will take and review any necessary x-rays, do an exam of the teeth and gums looking for tooth decay, broken or misaligned teeth, gum tissue inflammation, infections, build up of tarter as well as a look at the tongue, floor of the mouth, the cheeks and the roof of the mouth to see if there are any suspicious areas that should be considered as an abnormal pathology or oral cancer. We will also check all of the existing dental work you have to make sure crowns, fillings, bridges, implants and other work is in good shape or need attention. Periodic Exam – Also called a Periodic Oral Evaluation, is the exam that is given during your regular, 6-month dental check-up. The periodic exam is basically the same as the comprehensive exam, only coded differently for insurance and medical records purposes. Limited Exam – Limited Oral Examination, is an exam that is focused on a problem. these are usually emergency exams where the main goal is to relive an urgent problem, rather than addressing the total care needed for overall oral health. Panoramic Radiographs – sometimes called a “pano” is a type of x-ray that takes a picture of the full mouth and jaws, and shows us the location of the teeth, sinuses, the TMJ and other structures. These are useful in the diagnosis of wisdom teeth extractions and planning for implants. Bitewing radiograph – Is a picture taken from the side that shows us the spaces between the teeth, where dental cavities often appear. Periapical radiographs – Also called “PAs” are pictures that show us an entire tooth, from top to root tip. These are useful in diagnosing problems with individual teeth, such as the need for a root canal. Full Mouth Series – The full mouth series is a combination of bite wing radiographs and periapical radiographs that show us the individual teeth on a close-up scale compared to the panoramic radiograph. These are useful in determining your overall treatment needs and your current oral health status. The Smile Center uses modern, all digital x-ray equipment. New, modern digital x-ray machines produce far less radiation than the older film based systems. Today, you are likely to get more radiation from typical day-to-day activities than you are from a single digital x-ray. Modern x-ray equipment is very safe. In days gone by, the level of radiation during a routine film x-ray was many, many, many times greater than the digital sensor systems used today. So, even in those long ago times where film was the standard, x-rays were safe at the level, speed and quantity used in dentistry. Today, the amount is much smaller than the radiation that is regularly introduced to people from their daily activities.